Flurry for breakfast...or lunch, or dinner. I made these placemats for my guild's holiday swap. 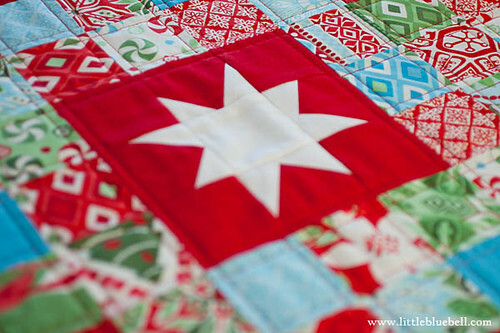 A little patchwork, a liberated star and a lot of happy holidays!! I used Flurry by Kate Spain and Moda Bella Solid in Christmas Red and White. This corner makes me happy. I'm always looking for ways to improve my corners. I tried a new (to me) technique and it worked out pretty well. Instead of stopping 1/4" from your corner and ending your stitching line, you turn it 90 degrees and sew right off of the edge. Kate Spain sure has a way with Christmas fabric doesn't she? 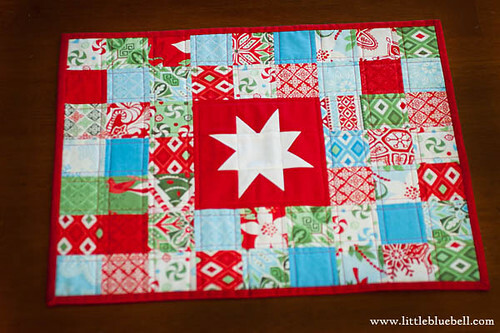 Did you see the sneak peek of "Joy" on Kate's blog?? I LOVE it! It's so JOYful. Bah-dum-ching. ; ) Zig zags? Snowflakes? and Winter Mint? Yes please!! Here's a closer look at Joy from Moda (pdf). Here are the BAMQG swappers (I'm at the bottom left, kneeling and holding my awesome aprons from Jen). very nice mats! i do love those fun stars! Awe, I love Flurry! I thought it was amazing and even won a Fat 1/8th bundle. I sewed a little with it, but still have more left....hopefully next Christmas! What is your apron made from? bliss? or something else...looks beautiful. Lovely! And please do spell out how you did those gorgeous corners for newbies like me... I can't really picture what you mean. Thanks in advance in case you do show us. I'm gonna need a demo of that technique! Maybe some day I'll actually get myself to a BAMQG meeting again. Oh I need to try that technique too...thanks for sharing it, BUT I LOVE your placemats! love that fabric!!! I love this project! Such a cool way to showcase such a fabulous fabric collection. I have some of Kate Spain's previous Christmas fabrics, but haven't used them. You have definitely inspired me! Super cute! I do like the flurry fabrics. I had read about turning and sewing off the edge but had not tried it yet. Good to hear that you thought it worked well. I'm getting ready to stitch down some binding so I'm glad I read this. Timing is everything! Your placemats are lovely. :-) You'll have to make some to keep for yourself now! Love the flurry placemat!! Great fabrics! 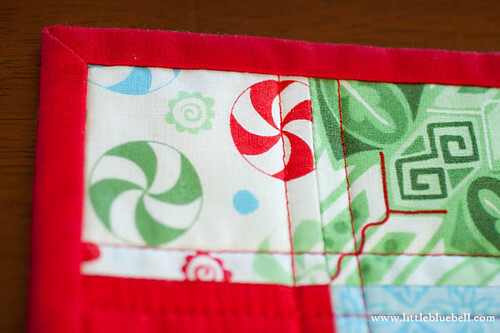 I must get Christmas fabric for next year!! Love! Mini projects swaps are so fun! (your binding corners look perfect!!). You know I love those peppermints, Adrianne! Such a cute little project! Yup. It's a little known fact about me.